Well, I suppose it all started last year when my family decided that perhaps it would be a bit of fun to try to grow some of our own vegetables. At first, my other half had designs on digging up the flower borders in his new-found bid at self-sufficiency. Not quite what I had in mind! Time for a compromise. The side lawn had always been used by the kids for football, games etc but they have now outgrown this (too many broken windows suggest this!) so this would be the site for the new vegetable patch. Now, the proper gardeners out there will be quick to say that this is not really the criteria for choosing a plot, yes I know but sorry, the flower borders stay. The other issue totally irrelevant to gardening that was important is the fact that this area is viewed by passers-by, so my request was for something that looked presentable and not too much like a neglected allotment. We decided to put in raised beds, with paths between so that vegetables, herbs etc could be harvested easily (getting ahead of ourselves here) and hopefully would be easy to maintain. After several trips to the builder’s merchants, much sawing, hammering, measuring and a little bit of cursing we finally had our raised beds and paths in place and ready for cultivation. My husband thought the hard work was over. So naive! 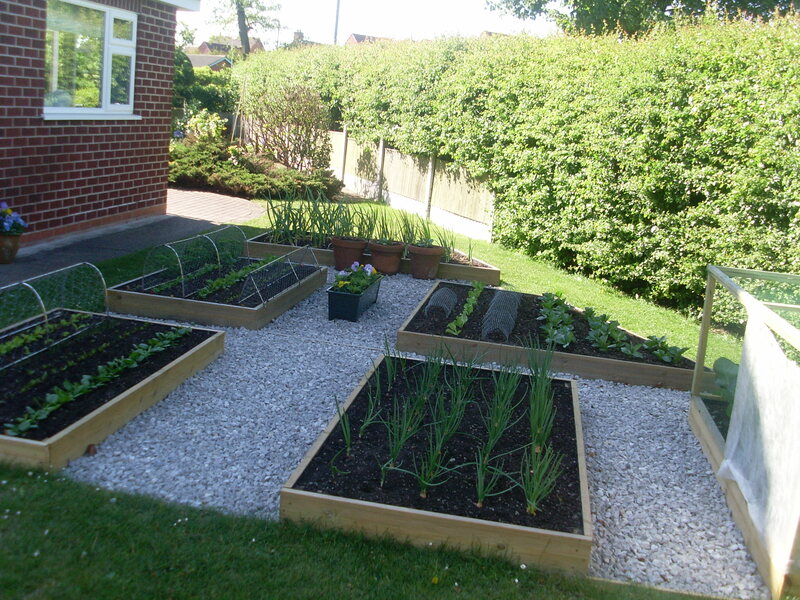 Seeds were sown, plants purchased and donated and the raised beds started to look the biz. They caught the attention of the neighbours who were impressed with our endeavours and helpfully imparted useful knowledge to help in our efforts at vegetable production. Not to be deterred my husband soldiers on and we have had some lovely produce, potatoes (grown in pots), beetroot, onions, beans, radishes, spinach, courgettes, various types of lettuce, lots of herbs,rhubarb, red currants( a few anyway) etc. I also manage to turn some into jams, jellies and chutney (I’ll probably talk about these another time, so many good recipes to share) Then one morning we get up to discover a mound of freshly dug earth, a mole has decided to tunnel towards our precious vegetable plot obviously on a mission, bush telegraph has been at work! What else could try to threaten our endeavours? This year I thought my husband might be re-laying the lawn, but no out comes the wood, saw, screws yet more raised beds are fashioned. They are now showing some signs of growth and our mouths water at the prospect. This year we seem to have attracted another problem, ducks. I think they must have received word of a good place to spend a bit of time feasting. Blackbirds have nested in the hedge and are now raising their fledglings, yes you’ve guessed it digging up the seedlings in their quest for worms in the raised beds. 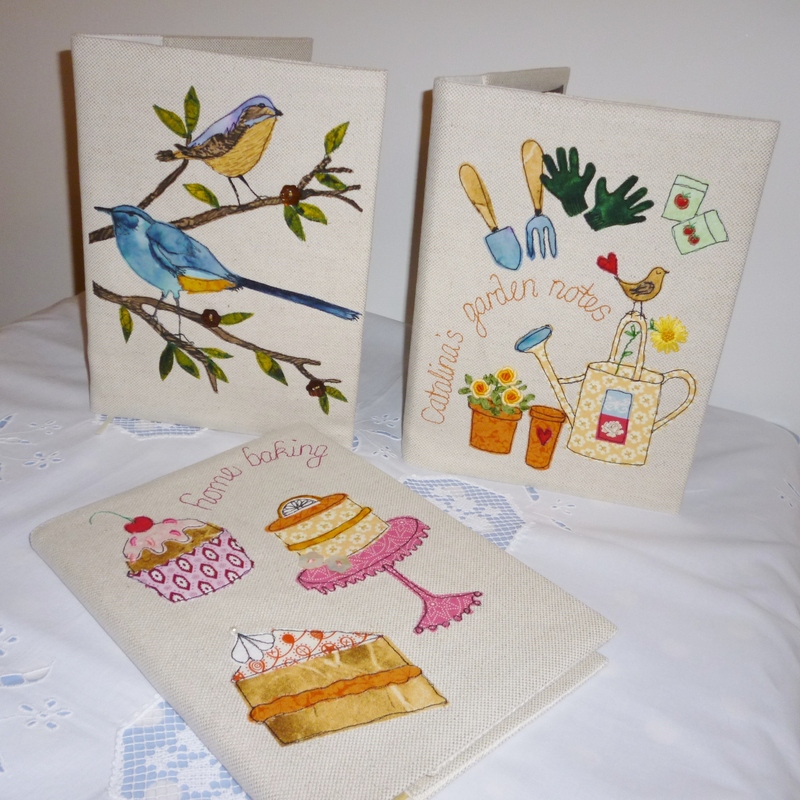 When I’m not on duck patrol or blackbird watch I have managed to be inspired to create some lovely garden themed fabric covered books. 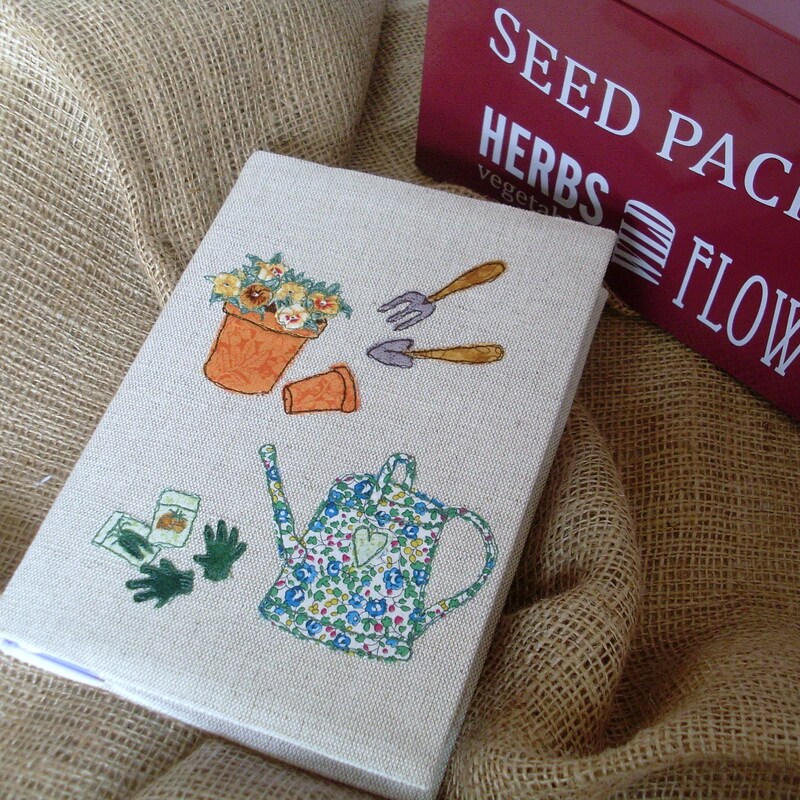 These seem to be popular purchases for people who like to keep diaries, journals, gardening and recipe notes and would make a nice gift for a garden fanatic. 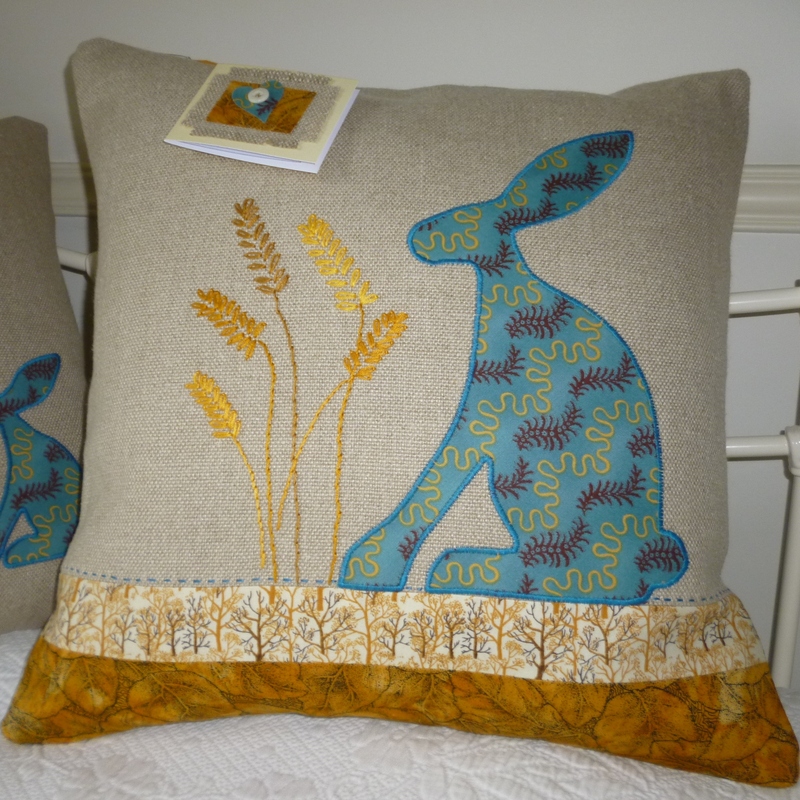 They are available to purchase through www.janelightfootdesigns.folksy.com They are individually designed and feature free-machine embroidery. The covers can be slipped off and reused once the notebook is full. A5 hardback notebook is included to get you started. 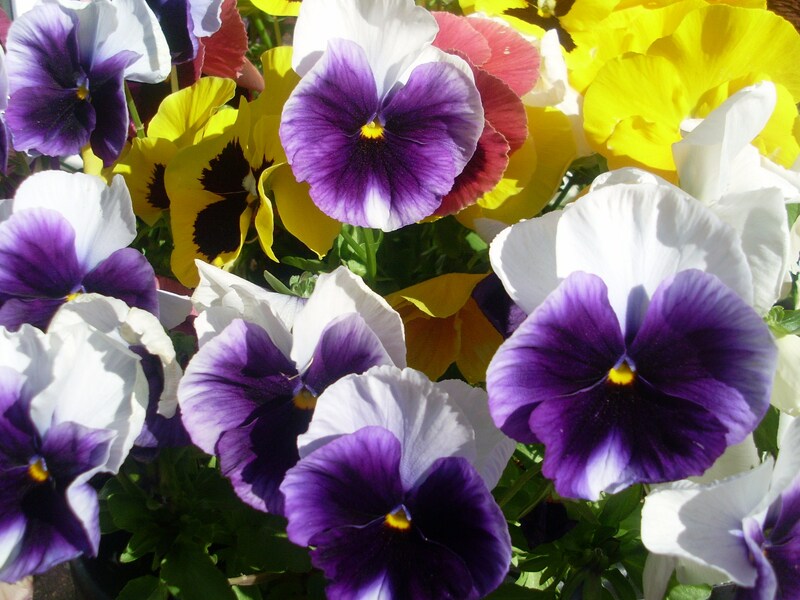 Wishing you happy, bug and pest free gardening. What an interesting read, never a dull moment at yours, how amusing all those little critters must be. Your designs on the book covers are wonderful such thought has gone into the details. 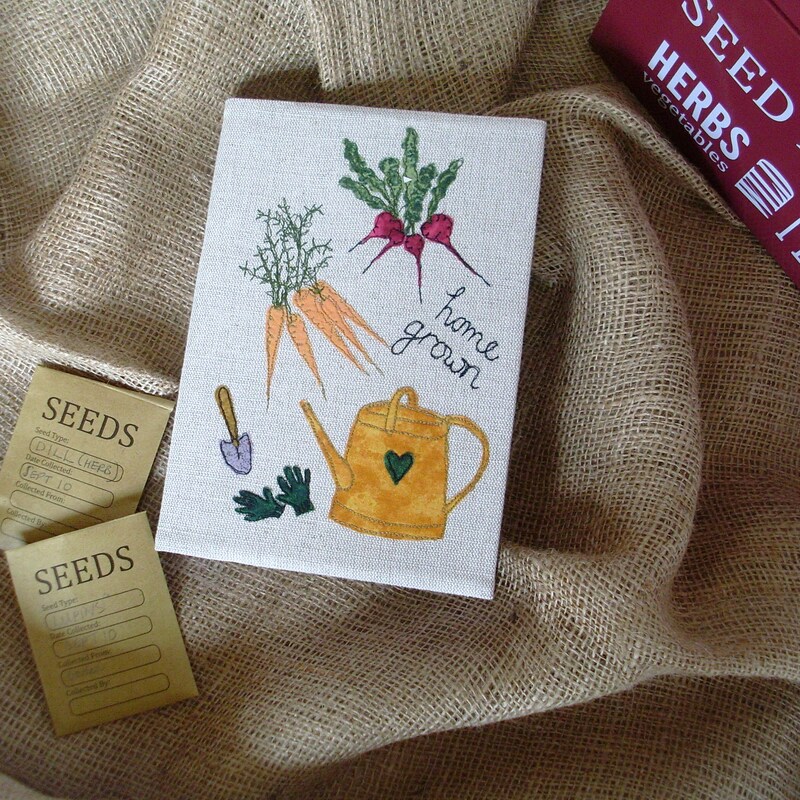 Happy gardening, designing and of course eating. 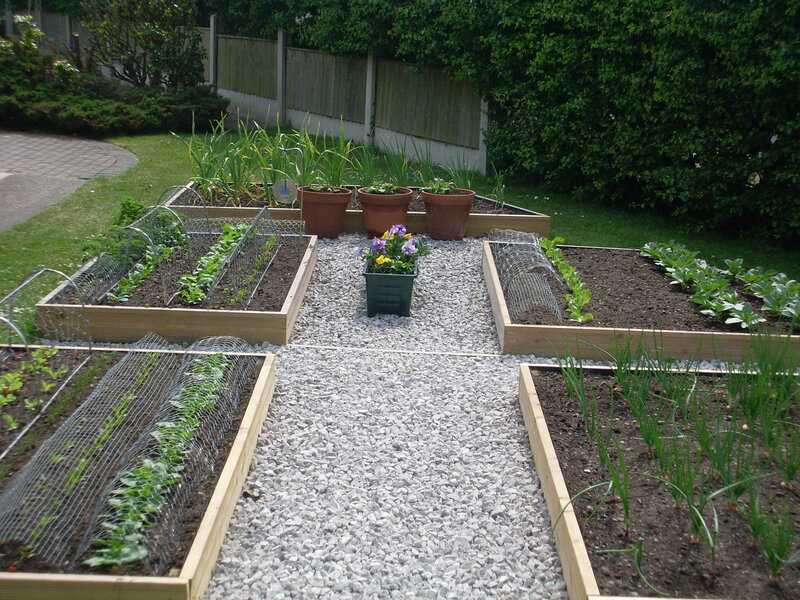 What a neat little veg patch – wish my garden was as tidy. Your designs for the book covers are so lovely, almost makes me want to start writing a diary – as if I had the time! I’ve seen some of your work at ‘The Secret Garden’ and they are even better in real life than they are on your website. 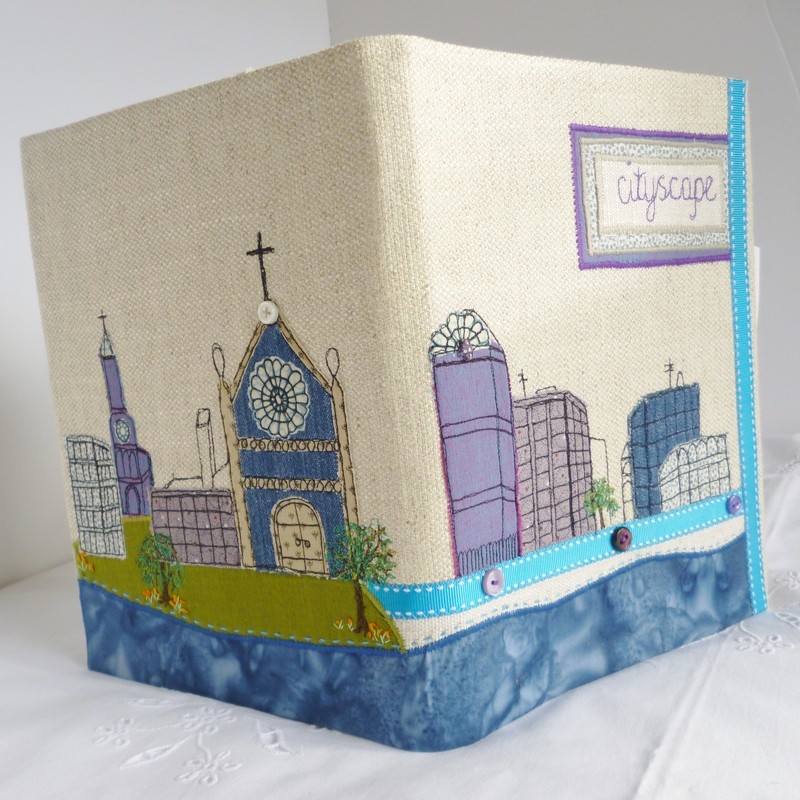 The quality of the stiching is the finest I’ve seen. I’m sure anything you’ve made would last forever and such lovely gifts. I’m definitely going to purchase one of your cushions. Look forward to hearing more about the veg man’s progress. So this is what you’ve been up to whilst I’m away at Uni? Where am I supposed to play football?! Looks great, keep up the good work mum. I was looking for ideas for making a little egg cosy for a friends new baby, when I came across your Folksy shop. 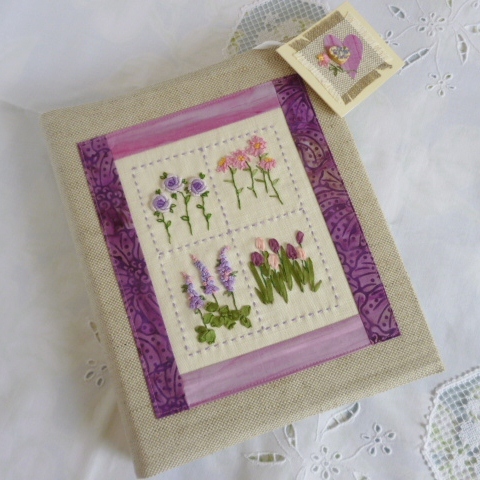 I am really impressed with the talented people on Folksy and try and buy most of my presents from there. I have really got disillusioned with high street shops and I am more inclined to buy vintage and Folksy when I can. I haven’t received a message from you on my blog. It must have got lost in the ether! I know what you mean about ducks/blackbirds etc. I think I’m feeding most of the baby blackbirds in our village. I have one male blackbird that comes and sits on the door handle and taps the glass if I am not quick enough with the sultanas! 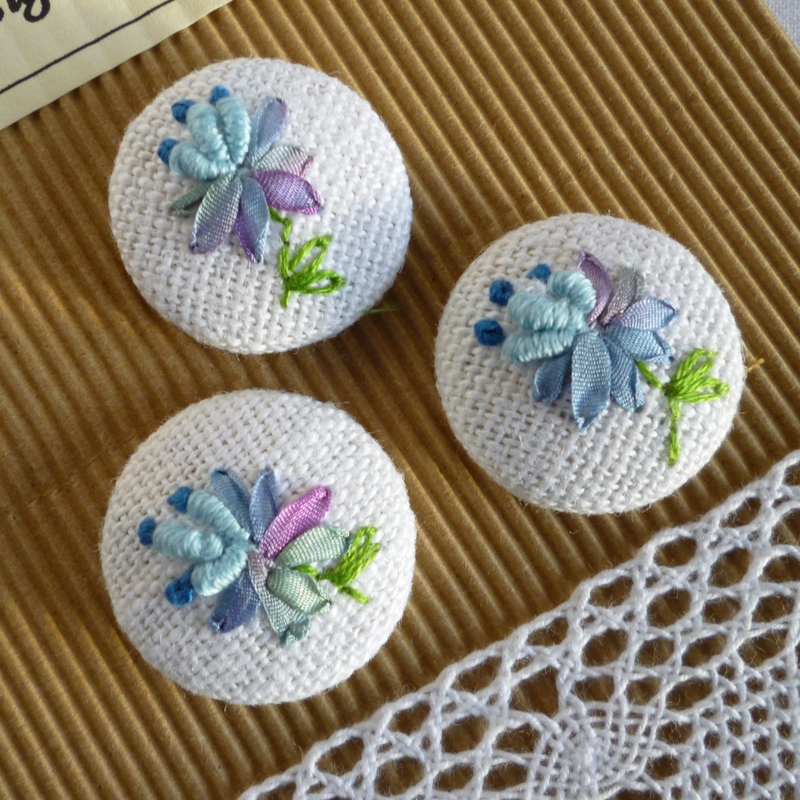 Thanks again for getting in touch and I shall keep an eye on your shop and the lovely things you make.